Virgin Voyages has revealed its first cruise ship will be adult-only. 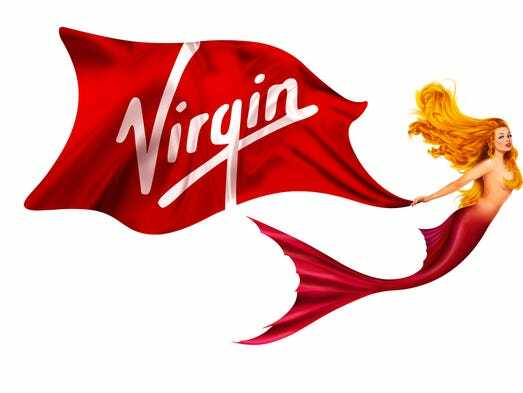 The decision to not allow children on board was taken after consulting travel professionals and “future sailors” – Virgin’s term for passengers. 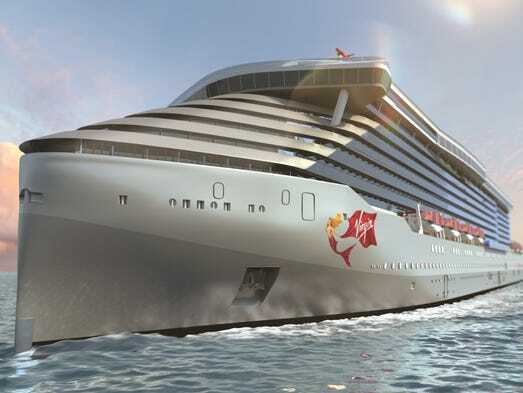 Virgin Voyages three-ship fleet will be known as the “Lady Ships”, a play on the term “your ladyship”, which the line said was a nod to British heritage. The ship’s design, which was unveiled at a keel-laying ceremony at Fincantieri’s shipyard in Genoa, Italy, today (Tuesday), will feature a silvery-grey hull, with smoked glass and splashes of red, while a mermaid design will feature on the bow of the ship. The first vessel is due to be delivered in 2020. Group founder Sir Richard Branson and Virgin Voyages president and chief executive, Tom McAlpin, arrived at the ceremony via a 200-foot crane drop. Staying true to its promise of breaking with tradition, the line is calling cabins with balconies “sea terraces” and passengers will be referred to as “sailors”. Customers and travel partners can place a $500 refundable deposit for access to a pre-sale before Virgin Voyages goes on general sale. The Brooklyn Cruise Terminal, the New York City home for Princess Cruises and Cunard Line ships, will get $17.2 million in upgrades. The funds will go toward building a new apron up to 500 feet long, a passenger viaduct and two new gangways. They will also pay for the design and implementation of a high-capacity wireless network at the terminal, according to an announcement from the New York City Economic Development Corp. and Brooklyn Borough President Eric L. Adams. Adams said $2.2 million in capital grants will be provided by the city and another $15 million will come from Ports America, the private operator selected to run the terminal in May. New York picked Ports America to run both the Manhattan and Brooklyn cruise terminals through 2029. 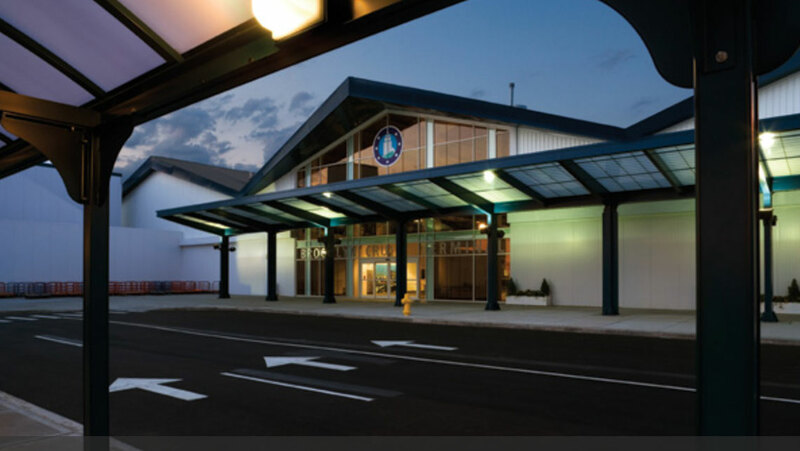 As part of the agreement, Ports America has agreed to invest $38.5 million in capital improvements at both terminals. The giant is almost ready. New photos from the shipyard building Royal Caribbean’s Symphony of the Seas — the largest cruise ship ever — show the vessel rapidly approaching the finishing stages of construction. As seen in the carousel above, the new images of the 230,000-ton ship show an exterior now gleaming with a finishing coat of paint and work well under way on outdoor decks including the Boardwalk amusement zone. Boardwalk will be home to a classic carousel, diner, rock climbing walls, the base of a nine-deck-high slide and more. Another highlight of the Boardwalk area, an “aqua theater” that will boast daring high-diving and aerial performances, also can be seen nearing completion in the photos. Royal Caribbean revealed earlier this month that Symphony would be ready weeks ahead of schedule. 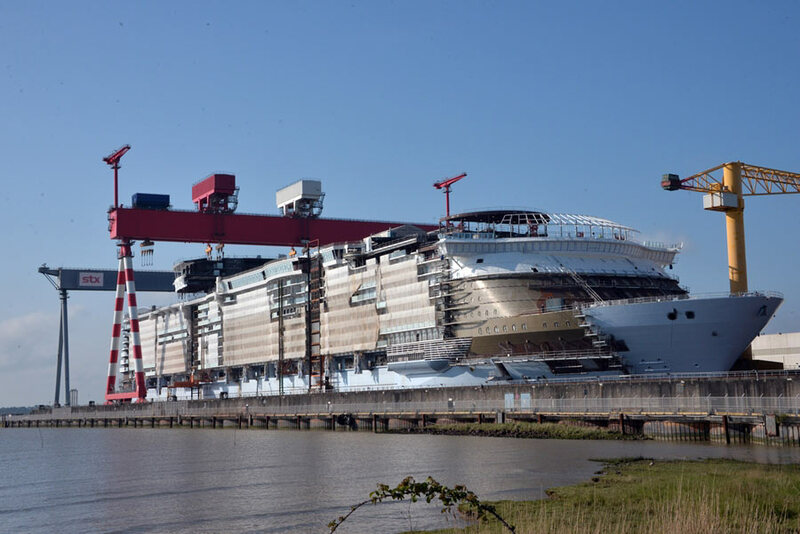 Now debuting in March instead of April, the vessel has been under construction for more than two years at the giant STX France shipbuilding facility in St. Nazaire, France. Symphony was floated out from a dry dock at STX France in June, a construction milestone that marked the end of basic exterior work. It is now undergoing months of finishing work to its interior. 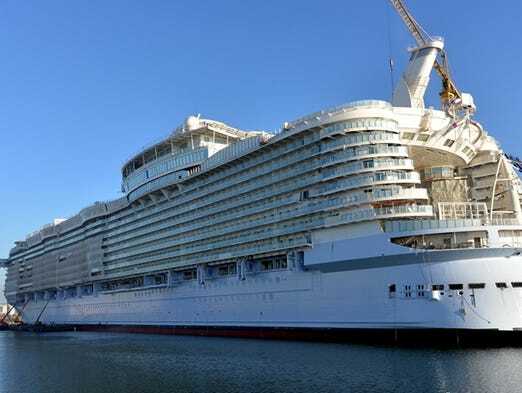 Symphony will be more than 3,000 tons bigger than the current size leader in the cruise world, Royal Caribbean’s 226,963-ton Harmony of the Seas. Like Harmony, Symphony will be part of Royal Caribbean’s record-breaking Oasis Class of ships, though it won’t be an exact copy of its sisters. Royal Caribbean has unveiled several new features for the vessel including a first-of-its-kind, two-deck-high family suite with a slide between floors. Symphony is scheduled to sail to the Caribbean out of Miami starting in November 2018. It’ll move to the city after spending its first few months operating voyages in the Mediterranean.